Kovair team is proud to announce the release of version 9.2 for its product Kovair ALM Studio. The document throws a major light on some of the latest enhancements and the new features that had been added to Kovair ALM Studio in this version release. Release 9.2 applications can be accessed by latest versions of Google Chrome, Firefox 54.0.1, and Internet Explorer 11.0. Kovair Dashboard offers consolidated view of multiple reports included in a single dashboard. All these reports in Kovair, consist of different types of filters for controlling the output. In this release, we have introduced the capability of having a single parameter a the dashboard level to control the outputs of all the reports included in that dashboard. Users will be able to select the value of this parameter at runtime. This value will be added to the existing filter of the report and the output will be generated accordingly. Prior to version 9.2, Kovair Multi-Lingual support was available only for field values. The labels for various items used to get displayed in English. With the release of 9.2, the Multi-Lingual support is available for labels of different items as well. The Multi-Lingual Support could be found for the following labels — Workspace Name, Entity Name, User Names, Form Section Names, Form Names, Attachment File Names, Comments, Change History, Version Comparison section. Expression Builder for searching calculated fields. Lookups for searching Lookup values. In version 9.2, users can reopen both expired and completed reviews. The implementation enables end users of Kovair ALM Studio to ‘Reopen’ to extend the ‘Review Deadline’ of a Review whose status has expired or change a value of an already completed review task. In case of active reviews, the application only permits Submitters and Moderators to delete the review. Prior to 9.2, a record once deleted could be restored within the same session where it was deleted. 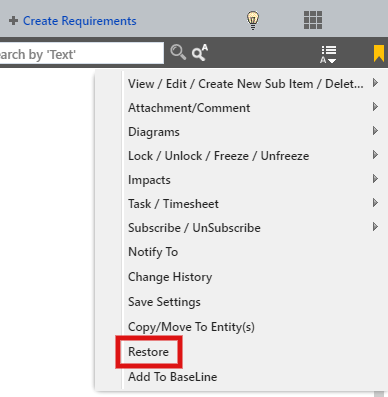 With the introduction of the new feature in 9.2, users can now restore records that have been deleted even after a session has expired. Users of previous versions of Kovair ALM Studio could not view the review status of an entity item that has been submitted for review. This made it difficult to track the progress, especially if an entity item has been submitted for multiple reviews. With the introduction of a new system form section called the ‘Associated Reviews’ in 9.2, users can view the review status of an entity item which has been selected for review. When a record is opened for viewing, this system section would enlist all the Reviews that this record has been selected for, along with the name of the Reviewers, the date on which the record has been reviewed, and the Status of each of the Reviews against the record. Users can view the details of the review by clicking on the icon getting displayed in Review Status column. Before this release, when any user visited the change history section of a record, the user used to see a blank list if the records were already archived. From this release, users will not see any blank screen. If the entire data state is in archive mode, then also they will always see the last 10 changes of the record. This data will be pulled from archive table. In Kovair 9.2 this feature will show a message during creation of a relation field if there is an existing relation between the two selected entities. This will help users to make informative decision about creating multiple relation fields between same set of entities. The new implementation will now allow Kovair Administrators to enforce users to add a comment before saving a record based on the business case. The enhanced feature can be used from the end user mode only after it has been configured by the Administrator at Workspace Level or from Site Level through Policy Configuration (Business Rule). Kovair ALM Studio 9.2 introduces 10 out-of-the-box report templates that target specific criteria for ‘Releases’, ‘Builds’, ‘Sprints (Iterations)’, and ‘User Stories’ along with the desired overview. 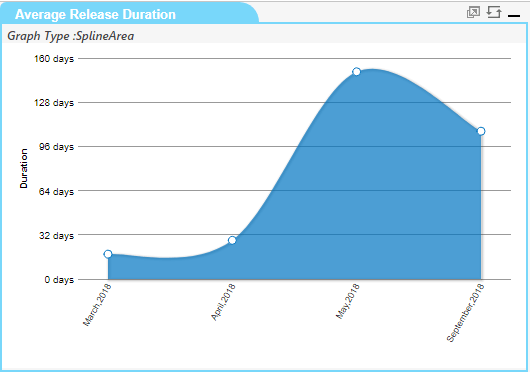 Release Duration – The Release Duration report shows the average release duration of all completed releases within a selected date range. The release duration will depend on the system defined date-time fields, the Actual Start Date and Actual Finish Date. 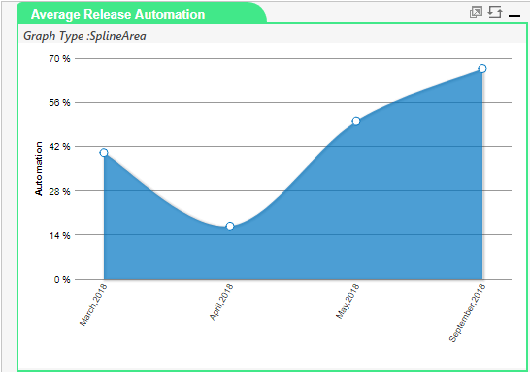 Release Automation – The Release Automation report represents the average release automation of all completed releases within a selected date range. The release automation will be calculated based on the system defined date-time field and Actual Finish Date (considering this field as the closing date for a release). 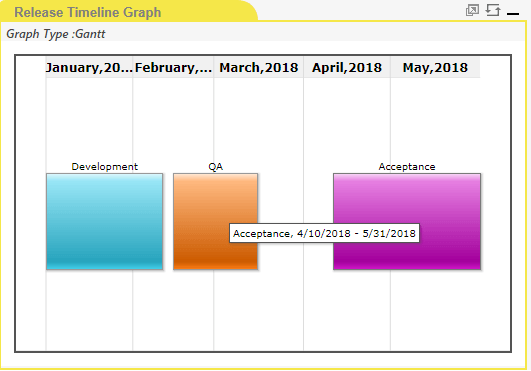 Release Timeline Graph – The Release Timeline Graph report helps to keep in check the planned start date and planned finish date of each phases specified in a release. It shows the timeline of a selected release along with the respective duration of every specified phase. 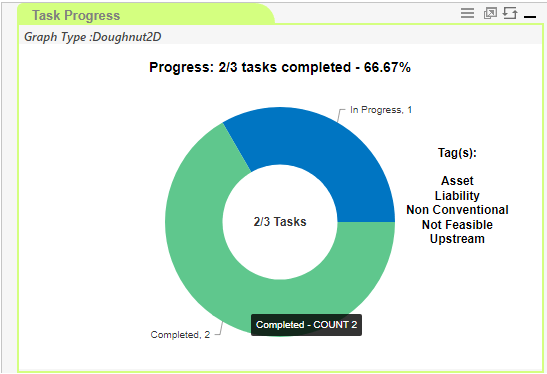 Task Progress – The task progress graph represents the ratio of completed tasks to incomplete tasks in a release. Users can also view the associated “tags” for each task. Build Health – The Build Health report characterizes the software builds. This type of report helps to categorize the number of builds that have been successfully completed, failed or are unheard of within a desired date. Users can also track the average duration spent for each build with respect to the date rage. 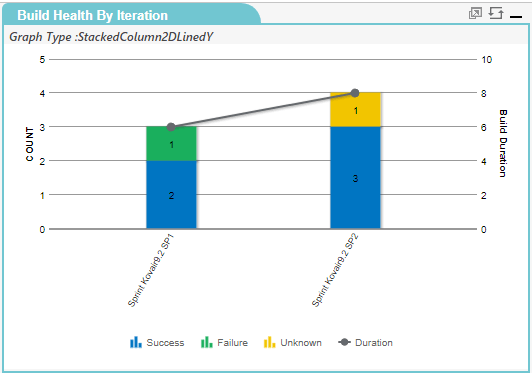 Build Health by Iteration – The Build Health by Iteration report represents software builds with respect to all or selected iteration (referred to as Sprints in Kovair) in a given release. Through the report, users can categorize the number of builds that have been successfully completed, failed. 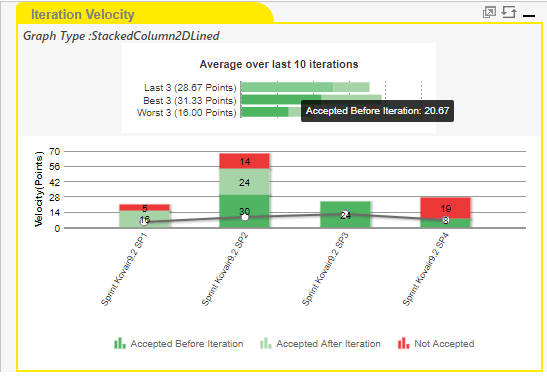 Iteration Velocity – The Iteration Velocity report represents the total and average (by line) velocity ( or points) of all associated user stories (or features) of a sprint. In this type of report, only the last 10 sprints of a selected release are considered and hence the total velocity ( or points) of only those user stories (or features) that are accepted before or after iteration is graphed accordingly. 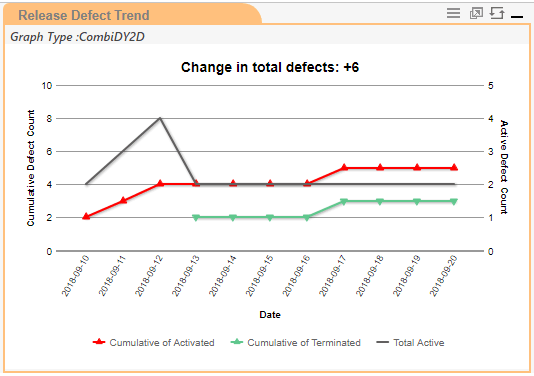 Release Defect Trend – The Release Defect Trend represents the cumulative of activated (open) defects and the cumulative of terminated (closed) defects along with the total active defect count with respect to a date range for a specific release. It also shows the change in total defects within the same date range. Story Burndown – The Story Burndown report represents the tasks to do (hours) and the Accepted Points of all user stories in associated sprints over those associated releases, the Planned Start Date or Planned Finish Date of which fall in and between the desired date range. 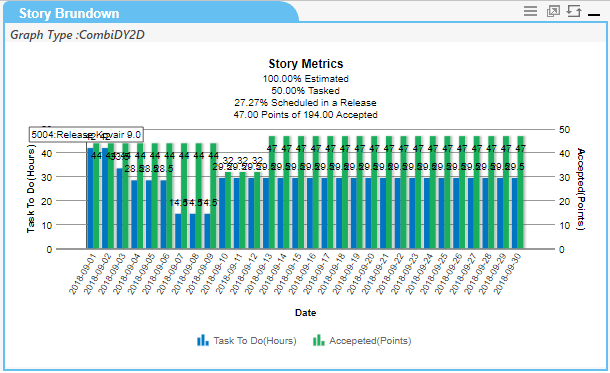 It also shows the exact Planned Start Date of releases considered and the story metrics of Estimated, Tasked, Scheduled User Stories and the Associated Story Points of all available points. Story Burnup – The Story Burnup report represents the accepted points of user stories of all associated sprints over those associated releases, the Planned Start Date or Planned Finish Date of which fall in and between the desired date range. 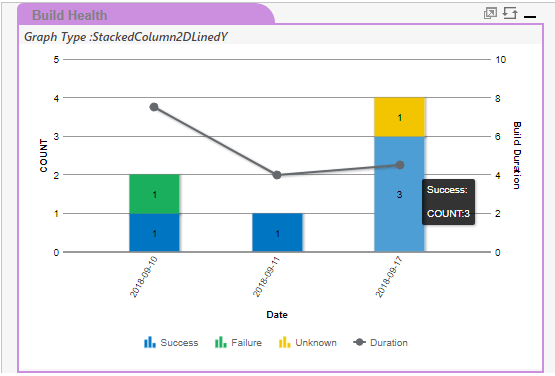 It also shows the exact Planned Start Date of releases considered and the story metrics of Estimated, Tasked, Scheduled User Stories and the Associated Story Points of all available points. Kovair iRise adapter helps to achieve integration scenario by establishing integration with other requirements management tools for better collaboration. With other integrations from Kovair, organizations can connect iRise with 80+ other ALM, PPM or ITSM tools. It exposes entities of iRise tool namely Requirements, Chapters and along with it supports the flow of attachments and comments. XATester is a unit testing tool for mainframe development. 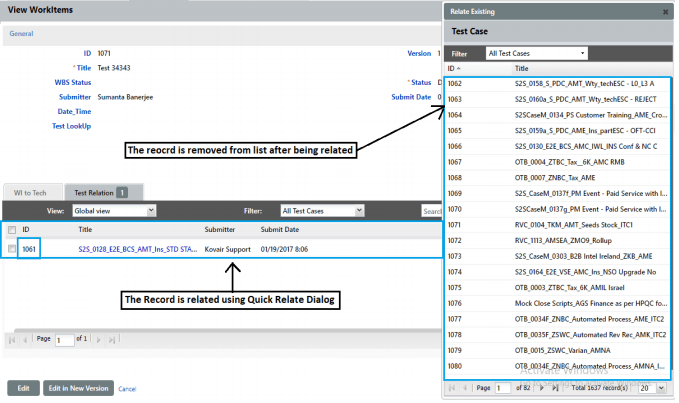 The Kovair XATester adapter helps users to fetch Test related artifacts and establish an integration with other test management tools like HP ALM. The primary entities for which data can be fetched from this adapter are, Test Case, Test Suite, Environment, Job, Category and Component. Also, Test Cases and Test Suites can be pushed into XATester from other tools. Kovair helps to achieve integration with Defect management tools like SmartBear Collaborator through the SmartBear Adapter. The adapter has support for two primary entities— Reviews and Defects. It supports synchronization of reviews and defects across other defect management tools and makes it more interactive through synchronization of review comments and attachments. Analyze, optimize, and predict bottlenecks in complex information systems by integrating the App Dynamics tool with Kovair App Dynamics adapter. The tool App Dynamics is a popular Application Performance Management and IT Operations Analytics tool used for monitoring the performance of all transactions flowing between integrated tools. The Kovair adapter enables the system fields of primary entities — Business Transactions, Tiers, Backend (for database and webservice), and node — to be fetched and synchronized across other integrated ALM tools. In addition, the adapter can also support multilingual characters for Project Name, Entity Name, and Field Values. With the help of the adapter, users can also reflow entity items from App Dynamics that have not yet reached the target tool from the source tool despite the integration. In 2013 version, the code structure of the adapter has been upgraded and no features have been changed. Widely used as an Email Application; the Kovair Adapter for Outlook 2013 also includes Task Manager and Contact Manager. Outlook is basically a Personal Information Manager that comes with Microsoft Office Suite. 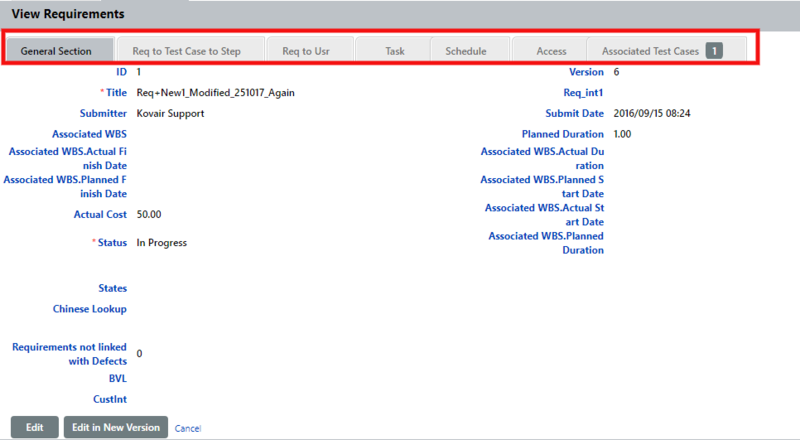 Kovair Outlook Adapter connects the ALM tools with Outlook application enabling team members to add Requirements, Defects, and Change Requests to respective ALM tools directly from Outlook. JIRA Cloud Zephyr when integrated with Kovair adapter, can expand the test management capabilities to several other integrated tools within the ALM ecosystem. Kovair Adapter can help to fetch data from JIRA-related entities like Bugs, Epics, New Feature, Story, Improvements, Sub Task, Task, Custom Entities, Sprint, and Test; including those enabled by Zephyr, namely Test Step, Test Execution, and Test Step Execution, to other integrated tools. The integration also gives complete visibility of information managed in JIRA Cloud Zephyr across the lifecycle, allow test execution information to automatically flow to other tools, record Test Results from test automation tools in JIRA. Redmine is a free and open source tool used for web-based project management and issue tracking. The latest adapter version can now support dynamically generated custom fields as well as Watcher fields. The adapter offers primary support for entities like Feature, Bugs, and Support. When the tool is integrated with Kovair adapter for Redmine 3.4.6, data related to these entities can be directly fetched from the Redmine tool to other related project management tools. Kovair adapter makes the integration interactive through the synchronization of attachments and notes as comments. In addition, the Kovair adapter also supports entity reflow, wherein the user can reflow those items from Redmine that have not yet reached the target tool despite integration. Kovair Global Adapter can now offer support for any HP ALM tool version. The global adapter will support integration with HP ALM Version 12.53,12.50,12.01,12,11.52,11. HP ALM is an all-in-all ALM suite for development teams, as it has all the core ALM capabilities on its own. When integrated with the Global Adapter, it enables users to manage requirements, releases, test folders, tests, test steps, defects, Run, Run Steps, Design Step across heterogeneous tool setup with the need manual intervention or traditional spreadsheet-based project management. Primarily used as a document management and storage system tool, SharePoint 2010, when integrated with Kovair adapter can integrate the tool with other ALM tools, proving users with adequate knowledge and resources. Kovair SharePoint 2010 adapter has support for two primary entities namely Custom Lists and Shared Document as well as Many-to-Many field relation support between the entity records. Users can add, modify, delete. Kovair adapter makes the integration interactive through the synchronization of attachments and comments. In addition, the Kovair adapter also supports entity reflow for both Custom List and Custom Document type entities. Until 9.0, clicking on an entity from the navigational menu would expand the navigational panel first before users could click on an entity to view the entity page. From 9.2 onwards, users can now click on an entity from the navigation menu panel and the entity page would open without the navigational panel expanding first. This a new UI / UX improvement on how users can relate records of one entity with the records of another entity quickly from the Relation Section. Prior to 9.2, when users wanted to related entity records from within a record, a pop-up box would open containing the entity list page. In 9.2 version, the slide-open dialog box is the latest alternative option from where users can relate entity records. This gives uses the option to decide the way they the entity records to be related. The slide-open dialog box will slide open instead of popping up as compared to the previous versions. A sliding dialog box takes only a small portion of the space and not the whole page, thereby enhancing visibility of the View Work Items page. The benefit of such an enhancement is that users can quickly select the record of related entity and add it to the Relation section, while keeping track of the records that have been added to the list. This option is also available from the list page of any entity. Duration in Decimals — Users of Kovair Task Scheduler can now enter the total time taken to complete a project work in decimals. For example, if the user takes two and a half days to complete a work item, then he or she can submit the Actual Duration as 1.5, 2.5, etc. Automatic Adjustment of Start and Finish Dates — In the Task Scheduler, both the scheduled and the actual Start and Finish Dates are synchronously related to one another. That is, based on calculation, if the actual dates vary from the scheduled dates, then in that case, the scheduled dates will change to match the actual dates submitted. List Separator — In case of work items that are dependent on one another, the precedence helps to determine the order in which the dependent tasks will be executed. A work item can be dependent on more than one work item and in that case, more than one predecessor value would be required. In 9.2, users can enter multiple predecessor value, each separated by a semi-colon, which is the list separator. Kovair 9.2 has introduced an additional rendering option for lookups. That is — if a lookup is created by checking the option ‘Show Individual Items’ and a multi-valued lookup field is created with that lookup, then a checkbox for enabling Single Row Display will appear in the Edit Field Properties of the form section. If a Single Row Display is checked, then the lookup field will be rendered row wise if the lookup field has less than or equal to 15 lookup values. The provision for single row display of checkboxes will only be applicable if the user checks the Multi-Valued option during field creation. If the option has not been checked, then the lookup values would be displayed vertically along with radio buttons. Prior to 9.2, Kovair Form if selected as tab view, the entire application pane was splitted into half where the top part displayed the first form section where the rest of the sections appeared in individual horizontal tabs. The tabs always occupied 50% of the screen and the users had less visibility to the upper form section. Now in 9.2 this design has been changed. Now all tabs appear at the top without occupying any of the space for its contents. Clicking on one, would open its contents utilizing the space of the displayed form section. Assigning a user to a workspace has now become one-click easier with Kovair 9.2. While prior to 9.2, users could only be assigned from the Site Setup Mode, users can now be assigned directly from the Workspace level. This has made switching from Workspace to Site Setup level to assign a user less lengthy and tedious process, especially in matters of urgency when someone is already working at the Workspace Level. Inclusion of Mandatory validation for assigning List View pages to specific Access group. Parameterized Run Time Filter support for Single Parameter Dashboard. 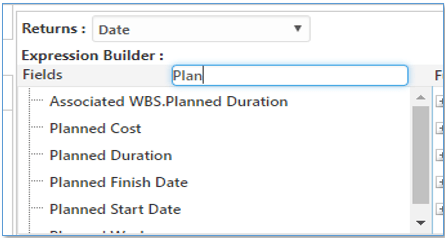 Segregation of Work Breakdown Structure Templates and Task Scheduler in Task Planner. Task Finish date of Scheduler to reflect in Project Calendar. Hierarchical Lookup values to maintain the indentation in Record Add/Edit Forms. Support for Bitwise OR operator for ‘Starts with’ and ‘Ends with’ functions in Search capability. Start Date/End Date, Interval, Effort values to reflect in the Story Burn Up and Story Burn Down reports. Support for Track Changes for an artefact having relation with One to Many cardinalities.